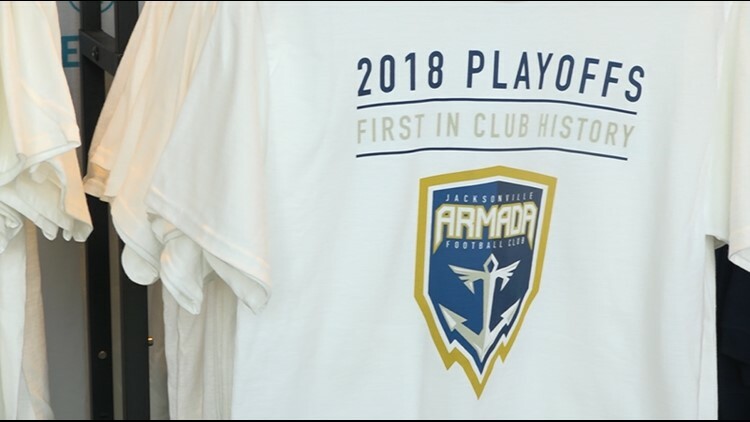 JACKSONVILLE, Fla. - For the first time ever, the Jacksonville Armada are making a run for the championship. Excited is an understatement to describe how longtime fans are feeling. “There’s always energy, there’s always intensity, but yesterday it was just at full capacity I guess you could say,” Jamie Gomez said of the atmosphere when the Armada defeated Miami United Wednesday evening. It was the team’s first-ever playoff appearance. Gomez, Michael Martinda and Chavella Rochelle are members of the fan group, Section 904. All of them were still riding the high of Wednesday’s playoff victory. Eric Turner, director of game day operations and events for the Armada, described the atmosphere Wednesday as “electrifying.” Turner said both he and the players are confident they can bring home the championship. “As long as they stay together, communicate, championship’s in the bag,” he said. “They throw it all out there, leave it all on the pitch, I have no doubt that they can definitely win,” Rochelle said. But there’s still that feeling of disbelief; Are we really here? Do we really have this shot? “It would just be…I just…I don’t even have words!” Rochelle said. The Armada head to Miami Friday to take on familiar foe Miami FC Saturday. You can send them off in style by going to the training grounds at Patton Park at 11 a.m. The team will load the buses and leave for Miami at 11:30.